I had this conversation with my mom earlier today, but you would have heard something similar in our house other days recently. 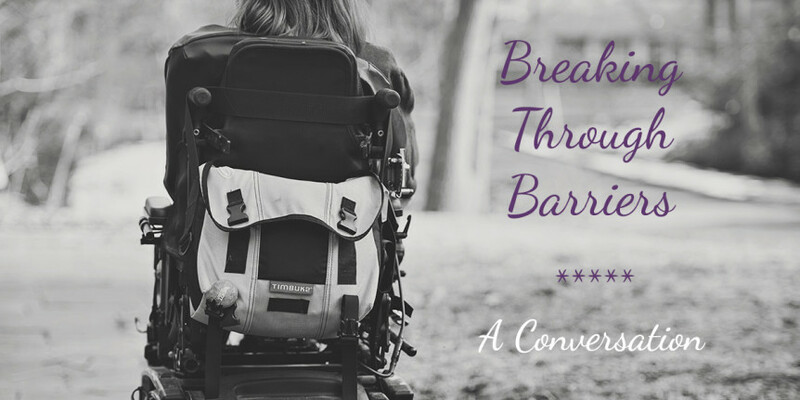 I’ve been facing a new physical limitation as I write my way through this blog series. Headaches, waves of dizziness, this feeling of unstableness. I’m not used to being so unstable on my feet and needing two hands to help me walk through my own house. I don’t understand all of it yet, but I’m seeing how this limitation is affecting my day-to-day productivity. It leaves me frustrated for two main reasons. I thought I was feeling better overall. I’ve been fighting thyroid disease for a few years now. I hoped everything would get back to “normal” and stay that way. God is showing me more expectations to dig out and name. Today, I will share these expectations with you. All this not feeling quite right presents itself as an unexpected obstacle or setback. An obstacle is “a thing that blocks one’s way or prevents or hinders progress.” The unexpected obstacle (i.e., the dizziness) creates a limitation, which then affects an expectation. God can reveal what that expectation is so we can know what to do next. I am not different. I first said that in regards to needing extra help to walk. This statement goes much deeper. I don’t see myself as different. I don’t want others to see me as different. But I have physical limitations. My body will do what I want it to do. With the addition of thyroid disease in recent years and “random” symptoms that seem to pop up, I have to realize my body will not keep up every day. It needs more rest and space to recover at times. I have to be productive. I have to DO something each day. I have ideas of getting things done by a certain time or reaching a goal by a particular month, year, milestone. In a way, this goes along with imagining I’d be married by 30. We don’t know God’s timing for anything, but we often want to rush to whatever is next. I want to rush ahead to feeling better overall, to days of not worrying about dizziness and instability in my movements. For now, I have moved to a different room to write. I’m not working in the quiet space of my room. I’ve changed my haven to another spot in our house. I feel a little more secure here and I will work as my energy allows. In between, I will rest and hope the new limitation will soon leave my body alone. I’m still learning to trust God in these unknowns, how to move through the unexpected, and accept the days that don’t look like I expect. If you missed how these expectations affect my identity, go here. Or read the last post about hope.